St. Patrick’s Day revelry in Savannah is expected to fill the streets of Georgia’s oldest city with thousands of tourists. The sprawling parade started in 1824 by Irish immigrants to the Georgia coast kicks off Thursday morning. And hotel managers and bar owners in the city expect the celebration to continue through the weekend. Some bars plan to begin pouring at 7 a.m. Thursday, a full three hours before the parade begins. They won’t close until last call at 2 a.m. Friday. Savannah last studied the economic impact of St. Patrick’s Day a decade ago, when the celebration on the cobblestone riverfront alone was estimated to bring in 30 million dollars. Turnout on peak years has been estimated at up to 400.000 people. St. Patrick is the patron saint of Ireland (although he was born in Britain) around 385AD. His parents Calpurnius and Conchessa were Roman citizens living in either Scotland or Wales, according to different versions of his story. 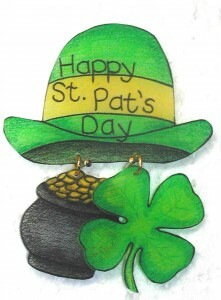 St. Patrick’s Day was first celebrated in America in Boston, Massachusetts, in 1737. Around 34 million modern Americans claim Irish ancestry. According to St. Patrick’s Day lore, Patrick used the three leaves of a shamrock to explain the Christian holy trinity – the Father, the Son, and the Holy Spirit. Popular Irish toasts on St Patrick’s Day, include: may the roof above us never fall in, and may we friends beneath it never fall out. Trifolium dubnium, the wild-growing, three-leaf clover that some botanists consider the official shamrock, is an annual plant that germinates in the spring. An Irish Mardi Gras of sorts, St. Patrick’s Day parades are filled with music, food, tradition and revelry, and take over the streets of these world-class cities. From green rivers to flying potatoes, online travel adviser Cheapflights.com has drilled down to the best of the best of the St. Patrick’s Day parades across the globe. Reuters does not endorse this list. 1 – Chicago. The Irish Miracle started in 1962, when the city of Chicago dumped orange dye into the river and it turned the entire thing green. Saturday, March 12th, they’ll do it again. The best places to see the spectacle are the East side of the Michigan Avenue Bridge, the West side of the Columbus Drive Bridge or upper and lower Wacker Drive between Michigan Avenue and Columbus Drive. After that, the parade kicks off on Balbo Ave and Columbus Drive in Grant Park at noon. 2 – London. Which will draw more celebration – St. Patrick’s Day or Kate and Will’s Royal Wedding? We’re betting on the latter, but more than 100,000 people are expected to celebrate on Sunday, March 13 to watch colorful floats, marching bands, and Irish groups to raise a glass to Ireland. Specific groups will represent Irish counties, there will be performances of traditional and contemporary dance, and the parade will process through central London from Green Park to Trafalgar Square at noon. 3 – Sydney. While most of these locales require patrons to button up and brave the cold, Sydney will celebrate its Irish heritage in sizzling sunshine. On Sunday, March 20, parade goers will don green sunglasses and green t-shirts. Fun-filled and exciting, the parade will represent all 32 counties, and have plenty of floats, costumes, music and Irish traditions. Keep an eye out for the green fountains all over the city. 4 – Boston. The first St. Patrick’s Day celebration in the U.S. was in Boston in 1737, and the first parade came along in 1901. Now, more than 600,000 parade goers rally each year to watch marching bands, pipe bands, and green-wearing partiers celebrate through South Boston. This year, it will be held on March 20, and begin on Broadway, through West and East Broadway, and then onto Thomas Park, Telegraph Street, and end in Andrew Square. Even if you can’t catch the parade, the city’s many Irish pubs go nuts for the festivities. 5 – New Orleans. Sunday, March 13 marks one of the biggest street parties in New Orleans – a St. Patrick’s Day parade that trades beads for potatoes and cabbages. Bring a picnic basket and enjoy the costumes, flowers, floats, and moon pies, or simply meander from club to club enjoying the festive atmosphere. Be prepared for floats passing by to throw cabbages, carrots, onions and potatoes. It all starts on Metairie Road at 11 am. True to form in New Orleans, the city proper has plenty of celebrations downtown as well. 6 – Dublin. Of course, anywhere in Ireland takes the cake, but Dublin and Galway both uniquely celebrate. The bigger of the two, the Dublin parade is largely entertaining, and part of a week-long festival, which includes the grand parade on St. Patrick’s Day itself. Theater troupes, artists, puppets, dancers, and marching bands from all over the world will accompany the celebrations, and on the other days (March 16-20) expect more fun like boat races, comedy shows and films. 7 – New York. Even though it’s an entire ocean away from Ireland, it’s no surprise that New York City has the largest St. Patrick’s Day in the world. Led by the U.S. 69th infantry, this rolling fête usually boasts around 150,000 marchers, and draws more than 2 million spectators per year. On March 17, it will kick off at 11 am on 44th Street, up Fifth Avenue, past St. Patrick’s Cathedral, the American Irish Historical Society, and the Metropolitan Museum of Art at 83rd Street to 86th Street, where the parade finishes at around 5 p.m.
8 – Savannah. A little southern hospitality goes a long way with the Irish, apparently. Savannah serves up green grits, green fountains and a whole lot of fun. More than 400,000 Irish-loving parade watchers will gather to experience the show on March 17th, and side events that are perfect for partiers and families alike. 9 – Galway. Another Irish gem, Galway has the smaller, quainter celebration of all things green. The charming town by the sea is known as one of the most picturesque places in the country, and people all over will celebrate dressed completely in green and waving the Irish flag, waiting for the parade to start on March 17. Drinking, dancing and pub-going are even more important than the parade itself. 10 – Montreal. It’s the longest running St. Patrick’s Day parade in Canada, and this year it will be held on Sunday, March 20. Tens of thousands of spectators forfeit their poutine for Irish fare, and although it’s a little more toned down that other places, it still packs a punch. It all starts at 12 noon at Fort and Ste-Catherine Streets. This entry was posted on Thursday, March 17th, 2011 at 6:48 am	and is filed under Festivals. You can follow any responses to this entry through the RSS 2.0 feed. Both comments and pings are currently closed.